USB connection power supply equipment, USB power supply can provide a more stable signal. Warranty: This Proster HDMI Splitter Provides 18 Months Warranty. 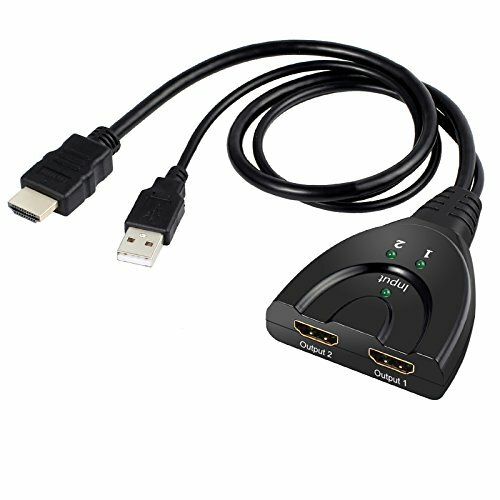 1x2 HDMI Splitter, One HDMI to Two HDMI Compatible Monitors or Projectors (Note: It's a HDMI Splitter Not HDMI Switcher). Support Ultra HD 3D and 4K*2K, up to 1080p Resolution; Compatible With 24/ 30Hz/ 2160P, 24/ 50/ 60Hz/ 1080p/ 1080i/ 720p/ 576p/ 576i/ 480p/ 480i. Plug and Play, Easy Installation. USB Power Supply Provides a More Stable Signal. Support Signal Retiming; Support Blue-Ray 24/ 50/ 60fs/ HD-DVD/ xvYCC While Works Well for HDTV, PC, PS3 And Many Kinds of DVD Players.